Two books have been recently discussed quite vigorously online: A Rant on Strawberries, Open Access Licenses and the Reuse of Published Papers and Apple Academic Press: Predatory publisher of scholarly books. The publisher Apple Academic Press (Apple AP) combines freely available open access articles on a common topic into books, which sell for about $100. Without informing the authors of the papers. In the first book no citations to the articles appeared anywhere in the book (Apple AP claims that this was a mistake) and in the second the references where given at the end of the book under "Authors Notes". Much has been written about how sleazy it is in comparison to what commercial publishers do. However, two important comments in the original blog posts have, in my mind, not really been discussed. Anyway, Im not sure who to be more upset with. The editor and publisher that (re)published the article, or myself for not noticing the reuse clause in the open access license. From now on I vow that I will pay closer attention to this, and it may influence where I end up submitting future papers. What is a viral license? This just won’t do. It’s not open access. To quote Heather Piwowar’s pithy statement once more, “We do basic research not only to know more, but to do more”. Non-commercial licences impede the use of research, and that’s not to the benefit of wider society. I recently came across to excellent sources for teaching advice. One is an article by Carl Wieman in Change Magazine called Why Not Try a Scientific Approach to Science Education? The other is the Instructor Guidance page from the Carl Wieman Science Education Initiative at UBC. Omit everything that is not necessary. The shorter the assignment is, the more likely the students will actually read it and focus on the key material. Some instructors believe in longer, less focused, readings from which the students are expected to extract the relevant material. This is an unrealistic expectation for a first exposure to the material. Your application was found very worthy of support. This means that your professional qualifications, your CV, and your project was of such quality and character that it would have been funded had there been sufficient funds. • demonstrate that your scientific production within the project area is on the same very high level. It appears from your CV that your publications within the project's subject area are not, to the same extent, published in the most respected journals. When assessing proposals for research funding RCUK considers that it is the quality of the research proposed, and not where an author has or is intending to publish, that is of paramount importance. Anyway, glad I got that off my chest. Now on to bigger and better things. • dokumenterer, at din videnskabelige produktion inden for projektets område er på samme meget høje niveau. Det fremgår af dit CV, at dine publikationer inden for projektets fagområde ikke i helt samme omfang er publiceret i de allermest anerkendte tidsskrifter. 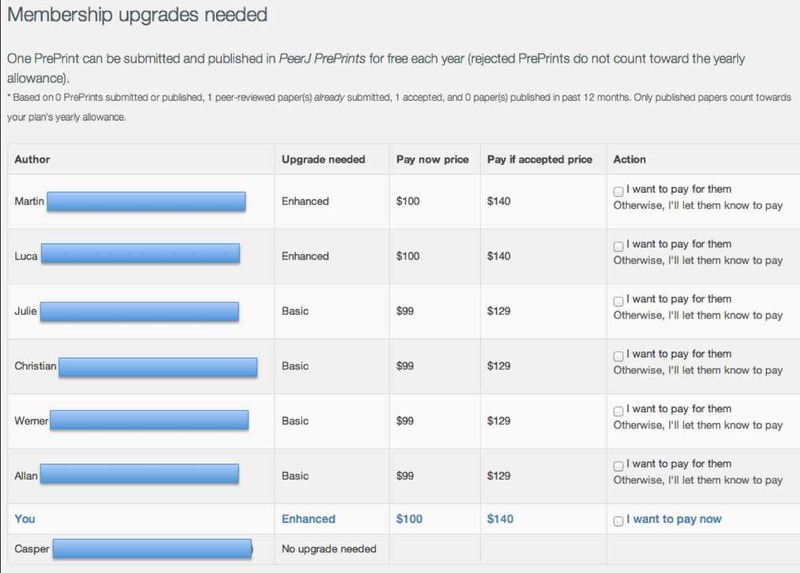 The PeerJ pricing scheme can seem a little confusing at first but it is actually pretty easy to use in my experience. We recently submitted a paper, which is now accepted!, and we have just submitted a new paper. I am the corresponding author on both and pay for all the authors. When we submitted the first paper I simply made a free account on PeerJ and submitted the paper. When the reviews came back I decided that it was very likely that they would accept the paper so I paid $99 for a basic membership for all the authors (Martin, Luca, Casper, and myself). We have now submitted a second paper. Martin, Luca and myself are co-authors together with Julie, Christian, Werner and Allan - but Casper is not a co-author this time. Below is a screenshot of one of the pages I see on my PeerJ account when I log in (it also contains email addresses, which I have censored). As you can see PeerJ makes it very easy for me to see how much I have to pay for each co-author. To pay, I simply check the appropriate action boxes and click an "upgrade now" button further down the page. Of course, I'll wait for the reviews before making a decision. I assume the web-page will also keep track of the date of the last submission by a particular co-author so that, for example, Casper can publish another article for free next year without needing to upgrade.